Visit Yoga Journey, Boca Raton! 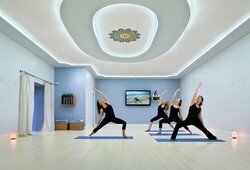 Expanding on our hotel’s commitment to health and wellness, guests and members of the community can enjoy 36 unique classes at our Boca Raton hotel’s on-site yoga studio, Yoga Journey! After opening a fitness center with her husband in Southern Florida, former advertising exec Leslie Glickman was introduced to the ancient practice of yoga. Over years of practice and dedication, Leslie opened up her very own studio, Yoga Journey, with a goal to bring the community together to teach and share the gifts of yoga, uplift lives, and send positive energy out to the universe. Today, Yoga Journey, Boca Raton is open to anyone who is looking to benefit from the practice of yoga. 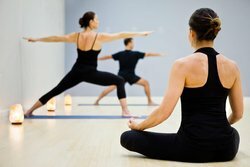 From people dealing with injuries to athletes and fitness enthusiasts looking for a way to clear their mind and balance their unique energy, Yoga Journey Boca Raton offers a wide variety of classes suitable to each guest’s particular needs. Highly skilled and motivated teachers lead guests through an array of classes including Vinyasa, Anusara and Mediation-style yoga. In addition to 36 classes per week, Yoga Journey offers workshops, teacher training, and Kula gatherings, in addition to a ton of other special events. Yoga Journey is open to guests staying with us at the Wyndham Boca Raton as well as anyone in the area looking to enjoy an energizing and refreshing yoga experience. The perfect accompaniment to every stay in sunny Boca Raton, visit the Yoga Journey website to learn more about class types & schedules.